Thank you to everyone who made this event a success. In August the NVCEO presented a seminar "Lessons Learned from Hurricane Katrina, featuring Ms. Bonnie Clark, Director of Equine Relief Efforts during Hurricane Katrina. Click here to obtain a synopsis of the seminar. Please visit our sponsors listed below and thank them for their very generous donations to this special event. Tell them you saw their ad on our website. Our two day benefit raised over $7300. The funds will be distributed to horse owners of the Gulf Coast region that were affected by Hurricanes Katrina and Rita. Horse owners that were affected by these natural disasters should contact their local State Horse Council to apply for recovery funds from the NVCEO Benefit Fund. 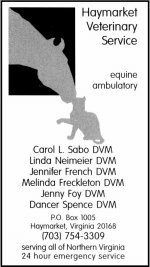 Please make all contribution checks payable to "Clifton Horse Society" and mark in the memo section of the check "NVCEO Benefit Fund". 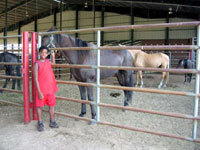 The Clifton Horse Society is a member organization of the NVCEO and will be processing all contributions for the Fund. The Clifton Horse Society is a tax exempt 501c3 Charitable Organization.